What made you choose Stanford University? Did you have any other offers and interest? Besides the fact that I’ve wanted to go since I was eight, Stanford seemed to offer me everything that I was looking for in a school, both academically and athletically. My two goals in my college search were to find a school that would challenge me both in the classroom and on the field. Stanford offers both. When I officially toured the school last year, I was able to look around the campus and see myself everywhere, whether it be studying in the library or sitting outside. Then, when I watched the soccer team train, and even played on the field myself, I could see myself playing there too, and participating wholeheartedly in the program. After that, I knew it was the place where I wanted to go. I did have other offers and looked at other schools, but Stanford remained the best fit for me throughout my search. How did you get seen by Stanford? I got seen by Stanford via the Stanford Camp and through the efforts of my coaches Carine and Gary Ireland. When my coaches found out I was interested in Stanford, they fully supported me and contacted the head coach and arranged for him to come out and see me play at our home field. Sending various emails and working extremely hard to provide me with the opportunity to work towards my dream, both were always willing to help me and played a huge role in getting me where I am today, but through their work with me on and off the field. I would describe myself as competitive and hard working. When I started playing soccer, I wasn’t particularly talented, but through a lot of work and training from PSV Union, I was able to vastly improve. I think my competitiveness is what enabled me to improve my skill work, vision, awareness, and technique, and it continues to help me improve. I have many things to work on, and I know that my drive and eagerness to learn and compete will continue to help me. I have been at PSV Union for about 8 years. I joined right before the clubs spring season started when I was turning 9 and have been there ever since. A normal week of soccer, for me, would be team trainings on Monday, Wednesday, Friday, and Saturday, and small group sessions on Tuesdays, Thursdays, and Sundays. Then, when I get home, I always do some form of core work and other exercises. I also keep a ball in my locker at school so I can play when I am not studying. During the season, we normally might have a game or two during the weekend, and during the winter, I elect not to play high school soccer and stay with my club team to train. In my trainings, I try to emphasize and focus on what I struggle with or feel uncomfortable doing. It is pointless to continuously repeat the aspects of the game you are good at when many other parts of your game are behind where they need to be. For me, I feel more out of my element with horizontal or diagonal movement with the ball. I need to improve on the skills and speed of footwork that will enable me to attack differently than just directly all the time. I need to improve my touch to improve the rest of my game. There are so many incredibly talented young players coming up through the club. I look at them and know that they are so far ahead of where I was at their age, and I really look forward to seeing how much they improve in the future. PSV Union really fosters an environment in which players are enabled to learn and love the game at an extremely young age. It proves to be an extremely effective process, as the players on the younger teams really do thrive. My favorite moment in soccer was the summer of the 2010 World Cup. Throughout the entire tournament, I would wake up, pack my lunch, and go to the field to train with my teammates and the older team for two hours in the morning. Then we would all move into a room together and watch whatever World Cup game was on that day. We would bet on the games, pick our favorite players, and form sides separated by which team everyone was cheering for. It was such a fun, exciting, competitive environment, and we didnt have to be playing to enjoy the game. Then, after it was over, we would put our cleats back on the train again in the afternoon. I never wanted the day to end. Being out there all day and enjoying soccer in all its forms is my all time best experience so far. My long term goals are to excel in college and get as far as I can with soccer. I know that I am going to be part of an extremely competitive collegiate environment, and my goal is not only to play well for them, but to stand out and thrive. I want to be able to contribute hugely to the program. After, I would love to be part of the national team and compete, and that is what I plan on working towards. Start taking soccer seriously as early as possible if you really truly love it. 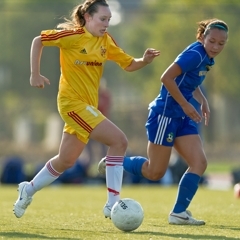 I remember my coaches telling me when I was nine that I would need all the time I had to really improve and make my way into the soccer world, but I always thought that it was expendable. I wish I had really started completely dedicating myself to the game so much earlier. Time goes so quickly. I look at the younger players and see myself in them all the time, and hope they take advantage of the time they now have more that I did because it really does make a huge difference. Q: How has PSV Union contributed to your development? "I actually can't think of a way PSV Union hasn't contributed to my development. I have been with PSV Union since I was 9 years old, and it is the only competitive club team I have ever played for. 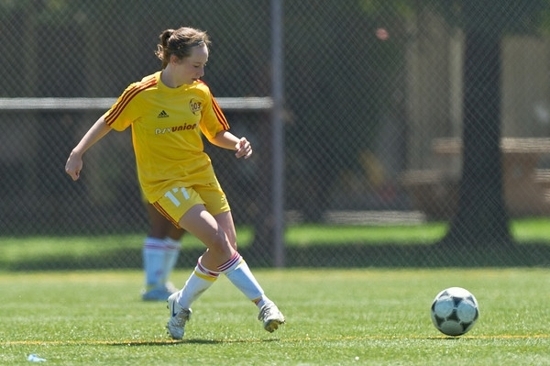 When I first joined, I was just a little girl who knew nothing but that fact that I loved to play. PSV Union coaches took my love of the game and showed me how to use to vastly improve over the time I have been with them. I went from not being able to pick up a soccer ball with my foot to juggle, to being able to pick up the ball in at least a dozen different ways and run across a field while juggling. I couldn't complete a simple scissors without falling over myself, and now I find myself working on much more intricate and detailed skill sets. PSV Unions dedication to technique and skill work has shaped my game, and I look forward to continuing to improve with them." Q: Is PSV Union different from other clubs? If so, how? "Although PSV Union is the only competitive club team I have ever been on, I do believe that it is different from other clubs. I have never seen or heard of an environment that matches that of PSV Union. Everyone coaching in the club is extremely dedicated and competitive, and always inspire the players. Coaches play with and against us to continuously challenge everyone, demonstrate everything first hand, and truly care about our development. They pass on their dedication to us as our injured players often come out to watch training sessions and PSV Union players get together outside of club to train together. It is an environment in which anyone who loves to play the game can improve." Q: How would you describe your clubs philosophy on player development. "There are so many aspects to our club's philosophy on player development, but I think everything roots from dedication and loving the game. I don't believe that a person can be taught by someone else to love soccer (it has to come from his/herself), but PSV Union takes the players that are truly dedicated to the game and build from there. 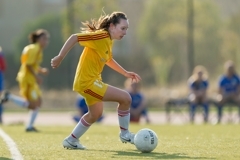 In the Club, there is a huge stress on individual development as well as playing for one's team. Individual development is encouraged through a heavy emphasis on skill work, technique, and creativity, and then each individual is able to contribute to the team effort." Q: How did you improve? What is the reason for your success? "I first began to improve when I came to terms with what I wasn't good at. It is definitely hard to look at yourself and analyze what aspects of your game need a lot of work, but when I did, I was able to focus in on where my game was lacking instead of just practicing what I was better at doing. Then, training wholeheartedly in an extremely competitive environment, as well as on my own, is what helped me improve. I believe I am successful because I'm competitive and have high standards for myself. I hate losing, so being in an environment where everyone is just as good as or better than me consistently forces me to keep pushing myself so I don't fall behind." Q: How often and What do You Practice? "I practice every day of the week, both on my own and with PSV Union. I keep a ball in my locker, so I always have the opportunity to train at school as well. In my own game, my technique and speed of footwork need improvement, so I focus on skill work (such as the 10 Vs, and the other sets of skills we work on at PSV Union) as well as different types of juggling." Q: What are your favorite things abou tthe club? "I love the environment PSV Union fosters for its players. Every day, regardless of whether it is game day or an optional training, I know that I will be working in extremely hard in a highly competitive and focused environment with coaches that love the game. I always expect to be pushed to my limit at training, by myself and my coaches, while just having fun at the same time. Everyone who is part of the club loves to be out there." Q. What kind of Player do you Need to be to Join Union. What attributed would you need to possess to be a player PSV Union coaches would be interested in coaching? "To join PSV Union, I believe a player needs to primarily love the game and be competitive with themselves and those around them. A player has to love being out on the field almost every day, even when they are struggling and exhausted. I think PSV Union coaches are interested in coaching players who are truly dedicated to soccer. Players that watch professional soccer on the television, players that have a favorite player and team, and players that love everything about the sport are the type of players that PSV Union coaches would enjoy working with and training."